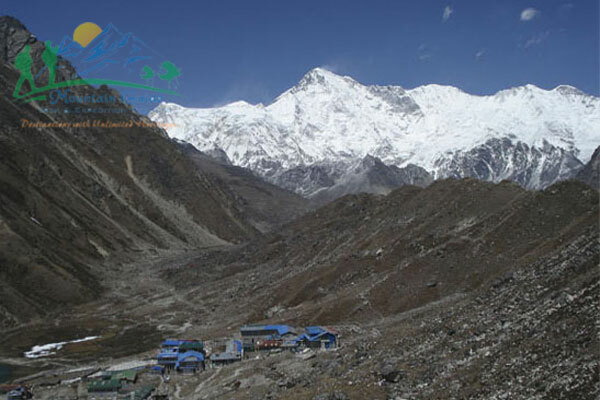 Everest three passes trekking is one of very special and more challenging trekking route in Nepal and also the most popular, recommended and demanded trekking trails in the Everest region. The most trek with unparalleled alpine beauty and without doubt the grandest mountain scenery on the world. 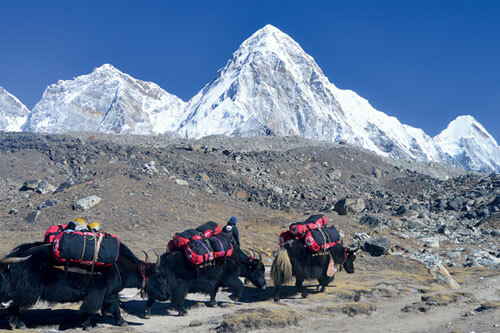 Everest 3 passes trekking with 3 most remote passes of the Everest region gives you an opportunity to explore with the entire overlook of Khumbu and Everest Himalayan range. 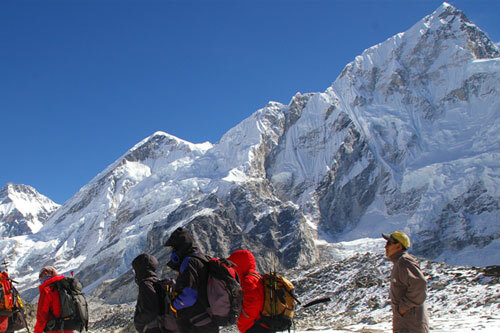 Everest three passes trek is demanding and more challenge but beyond this, the amazing magnificent, you will have from each passes dazzling and wonderful explored. 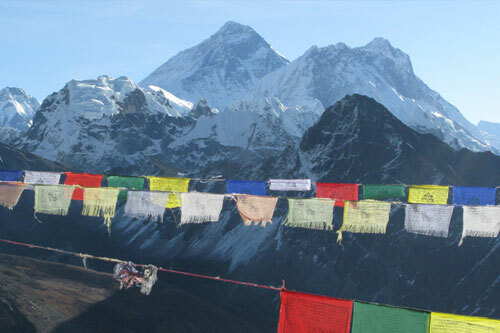 While on the trek, you are rewarded with the highest Himalayan peaks of the world. You will see the Roof of the world- Mt. 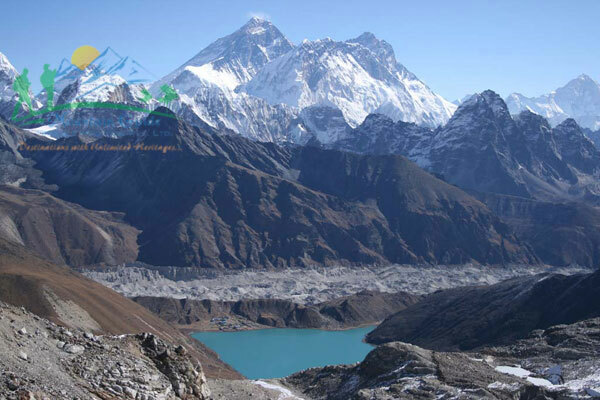 Everest with several angles, from Renjo-la and Gokyo Ri you can see panoramic view of full part of the Everest and from the Kala Pathar you will see very close view. 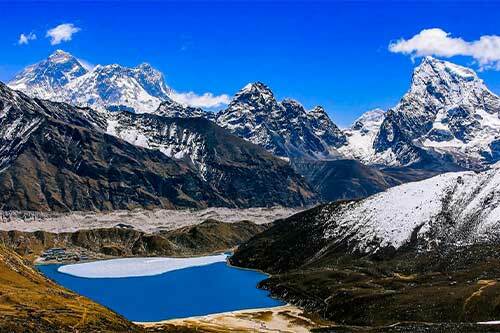 Other above 7000m peaks can be seen on this trekking are Cho Oyu, Lhotse, Makalu, Nuptse, Pumori, Amadablam and other 15 different high Himalayan peaks. 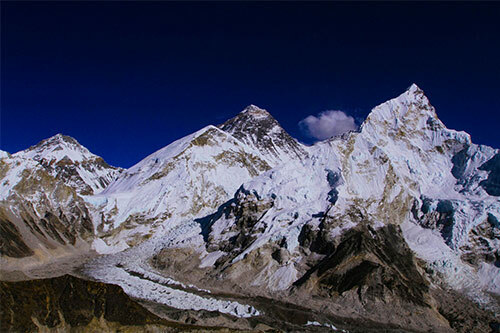 Among of them, Cho Oyu, Lhotse &amp; Makalu are the higher peaks above 8000m. 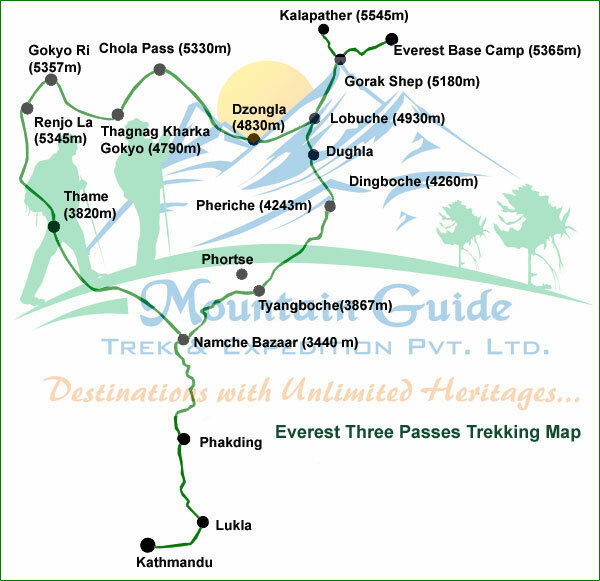 Having to cross three passes, you do not need any technical climbing requirement, anyone can do if you have good and strong health for Acclimatization condition and previous trekking experience can complete the trek successfully. 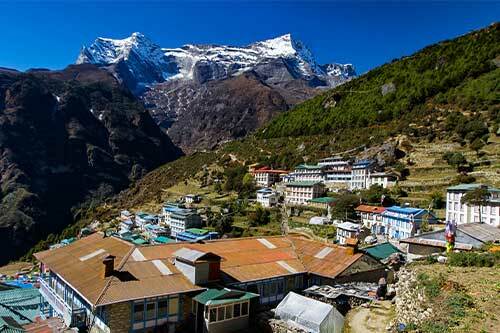 Day 19: Fly Lukla to Kathmandu - 30 min. (Useful Info: - Please note that often the Kathmandu-Lukla-Kathmandu flight gets delayed by a few hours or may even be canceled for one, two, or more days due to bad weather conditions. Such conditions may happen even in the best seasons. Therefore, in such cases, you must be prepared for long waits both at Kathmandu or Lukla airports, as this can happen either at the start or end of the trek or even both! We do our extreme to avoid such delays, and fix you on next flight. Still, we suggest you to be prepared for possible delays/cancellation, and if possible to come with some extra buffer days (1-2 days) at the end of the trip to accommodate such delays. We also organize Heli rescue in such conditions, if it's available and upon request by our clients. In case, the flight delay/cancellation happens at the start of trip and it goes so long that it disturbs your onward travel schedule, you are free to choose an alternative trip: such a trek in the Annapurna, Langtang, or any other regions. If you are not interested in the alternative trip and would rather wait for the trip, you are welcome to wait in Kathmandu for as many days as it takes to get a flight to Lukla). 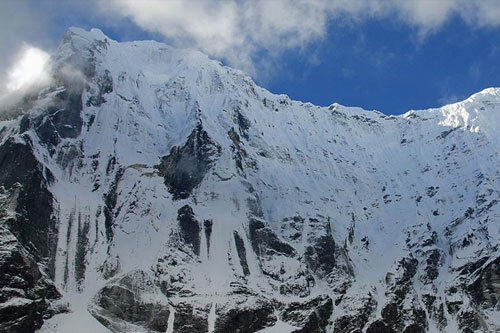 The following is a list of clothing and accessories that we recommend for Everest Three Passes Trekking Nepal. This is not intended to be a comprehensive clothing and equipment list; rather it is intended to act as a reminder of those items that we are feel necessary for your comfort and convenience. However we recognize that you may have your own personal preferences for clothing which may be equally as suitable.